Interior spaces are private and highly personal. We respect that. Your interior is a reflection of you. It creates an impression and expresses your personality, lifestyle and taste. Quality workmanship and attention to detail are the keys to our Interior Painting Vancouver WA. You know you have chosen high-quality interior painting when you call All The Walls for your Vancouver, WA home or business. We create an experience of positive and lasting value for our interior paint customers. We Measure our success by your satisfaction. Are there children in the home? Do you need durable or washable finishes? Do you have any pets to secure away from the work in progress? Do you have serious allergies or are you sensitive to the ingredients in paint? We can use low VOC, low odor and non-toxic products when available. All of our products are top-quality and made to last. 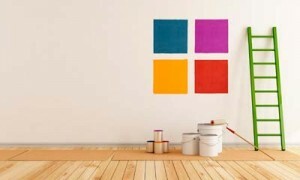 We make every effort to offer eco-freindly, green interior painting services. That is our commitment to caring about our Vancouver, WA friends and customers. We ask our customers to remove small knick-knack items, pictures, and anything else they’d rather handle themselves. We help move furniture and remove switch plates. We return them to their correct locations upon completion. Contact us for stellar interior paining in Vancouver, WA and the surrounding areas.